Global Solid Oxide Fuel Cell Market – Global Industry Analysis and Forecast (2018-2026 )- by Type, Application and Region. Home » Reports » Energy & Power » Global Solid Oxide Fuel Cell Market – Global Industry Analysis and Forecast (2018-2026 )- by Type, Application and Region. Global Solid Oxide Fuel Cell Market was valued US$600 Mn in 2017 and is expected to reach US$1,150 Mn by 2026 at a CAGR of about 9.5 %. The reported segment of Global Solid Oxide Fuel Cell Market based on type, application, end user and region. 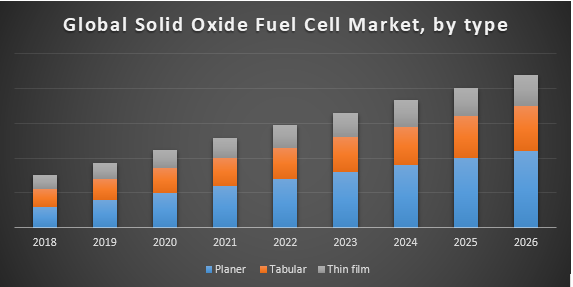 Based on the type, the Global solid oxide fuel cell market can be classified into planer solid oxide fuel cell and tabular solid oxide fuel cell. In terms of application, the Global planar solid oxide fuel cell market can be fragmented into Power Generation, Combined Heat & Power, and Military. By region, Global planar solid oxide fuel cell market is segmented into North America, Europe, Asia Pacific, Middle East & Africa, and Latin America. Reduce carbon emissions for consolidation energy security is one of the factors, which helps to boost the growth in the solid oxide fuel cell market. Renewable and cost-effective solution over the traditional energy source is the factor to boost the demand for a planar solid oxide fuel cell. Government subventions for a fuel cell in developed economies such as North America, Japan, and Europe alongside with growing demand for efficient power generation are the driving factor for growth in the planar solid oxide fuel cell market. The increasing costs of compounds and commercialization are swelling complexity in the formation of a substructure of solid oxide fuel cells will restrain the growth of the market. By type, solid oxide fuel cell market is estimated to grow at the high rate of CAGR during forecast year. Planar solid oxide fuel cell is widely used in commanding power module owing to it offers efficient flexibility. It is generally used in the power generation application. Based on the application, Power Generation segment is expected to dominate the growth in the solid oxide fuel cell market owing to the increasing demand of this cell for distributed power generation in commercial and retail and data centers. Global Solid Oxide Fuel Cell Market offers the efficiency of as high as 65 % as compared to other fuel cell technologies. The government subsidizations for fuel cell installations in the US and Japan are driving the growth for the power generation segment. In terms of region, Asia-Pacific is estimated to dominate the growth in Global Solid Oxide Fuel Cell Market owing to increasing demand for substitute electric power generation technologies, associated spending on the expansion of Solid oxide fuel cell technology. Furthermore, North America is expected to grow at the high rate in the solid oxide fuel cell market owing to the presence of the major key players in this region. Bloom Energy is the market frontrunner in the supply of Global Solid Oxide Fuel Cell Market. Doosan Fuel Cell America, Inc ,Fuel Cell Energy ,Altair Nanotechnologies Inc., The Babcock & Wilcox Co., SOFCpower, Chevron Technology, Delphi Automotive LLP, Protonex, LG Fuel Cell Systems Inc., NexTech Materials, Sunfire GmbH, Rolls-Royce plc., DDI Energy Inc., KERAFOL Keramische Folien GmbH, and Point Source Power, Bloom Energy, Hydrogenics, Plug Power Inc., Walmart, CenturyLink, Coca-Cola, Verizon. • The Babcock & Wilcox Co.
• Protonex, LG Fuel Cell Systems Inc.
14.3.24. The Babcock & Wilcox Co. Global Waste to Energy Market (WTE)- Global Industry Analysis and Forecast (2017-2026) – By Technology and Region. Global Thin Film Solar Cells Market – Global Industry Analysis and Forecast (2018-2026) – By Product, By End Use and By Region. Global Thermo Ventilators Market : Industry Analysis and Forecast (2018-2026) – By Type, Application and Geography.